Finding the Moral and Ethical Factors Within Values Systems. By generating good answers we generate better questions. We have used what we know to find out what we don’t know. In our quest for better questions that others have usually explored the territory which is the new focus for our testing. Using the wisdom and insights of others and combining it with our cumulative experience and research we have found a much more robust way of understanding human values systems and motivations. In this final paper we will show how the generation of good answers has led us to a ‘new, better answer’ to test in the next twelve months (and significantly sooner if possible). In this short series we have shown how we test and refine our understanding of well-tested academic models of values and personality. We have shown how we combine these independently derived models with our decades-long research into human values systems. This has led to a greater understanding of the multitude of facets that drive human behaviour. Our theorising (asking better questions), while driving the discovery of new models and the testing of those models on our national cultural samples, has not been limited to the factors we have outlined in this series. We also refine our current data sets by looking for additions to the CDSM Values Space. We usually run the tests on these single factors (as opposed to the whole models we have described) for at least two waves of research before including them in Values Space and using them in client engagements. We have no need to publish or perish like academics; we can take our time to ensure we have robust models to work with. Last year’s multi-country Values Survey in Europe (the UK, Germany, France, Italy and Spain) contained a range of single factors that were tested on a 10,000+ sample of age and gender-balanced samples of adults in those countries. The next wave of research will run these factors again to ensure they are both stable within Values Space and that they maintain levels of reliability. If they meet these criteria we will include them as standard factors within the CDSM Values Space in coming years. We have generated a working model, not a final, map of our expectations – part of a better answer. This hypothesis – a best guess – is shown below. The new factors (CDSM Attributes) are shown as purple squares and green stars. One or two of the ‘best guesses’ may fail to pass the stability and reliability test after the next research wave – but we are sure of their strength today. These 12 new potential Attributes will bring new insight into most areas of the map. 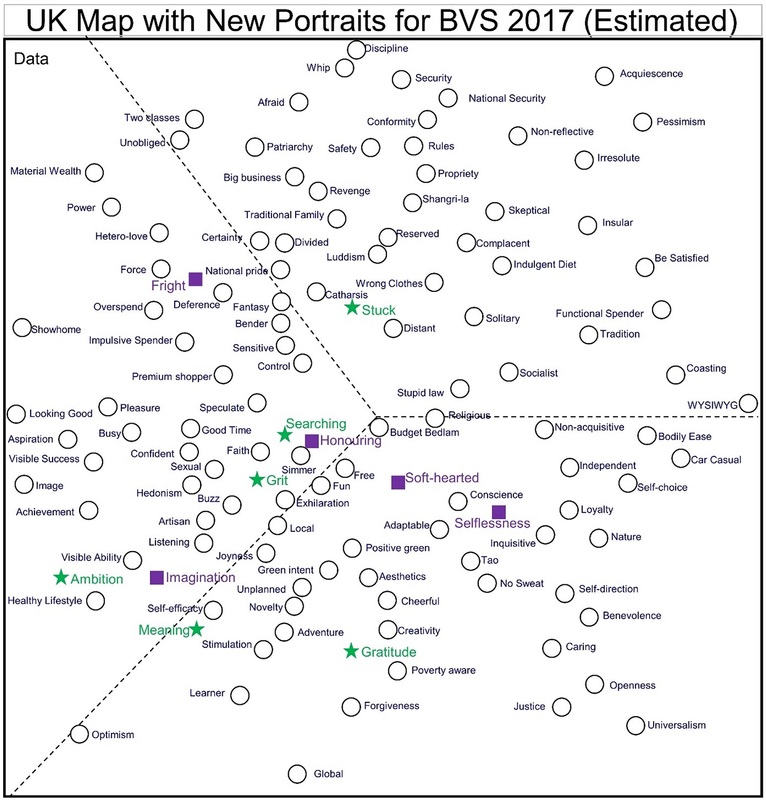 But just a glance reveals that the left hand side of the map is much more likely to be populated by these new factors. This leads us to believe that the Prospector Values Group will be more deeply understood. At CDSM we regularly think about our research in terms of our evidence-based comprehensive model – showing a multi-axis model of the human values system. 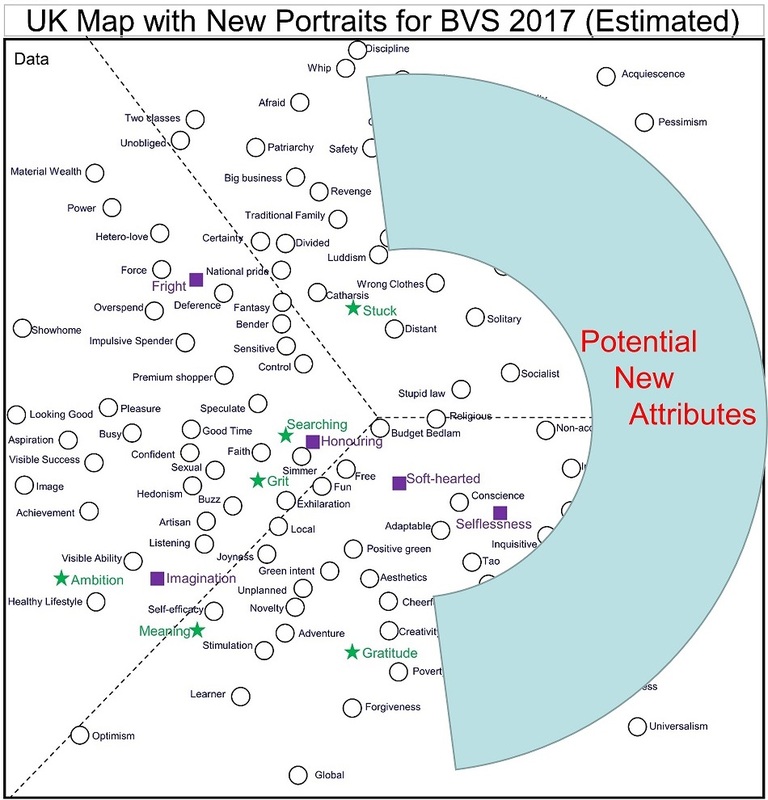 The comprehensive model is shown below and when compared with our hypothetical model we project that the ‘ME’ side of the map will potentially contain ten new Attributes with just two on the other side – the ‘WE’ side of the map. Better answers lead to better questions. As CDSM’s designated social researcher – reading up to 100 academic papers every month across a range of disciplines and topics, as well as more general media on-line and off-line – it seemed as if I would have to start digging into my files again to discover something we had missed or look for something we hadn’t covered yet. So, the first stop was past research files. Lo and behold, we both remembered that there was a model of moral values we had wanted to test a couple of years ago, but had run out of space on our British Values Survey, so parked the model until we could test it. This was the model developed by Jonathan Haidt - which we had found to be subjectively useful (but not yet empirically evidenced) in Values Space. We had developed an approach to a better question back then. It was most clearly formulated when we compared our emergent theory of how the evidence might correlate with the SIMS model. 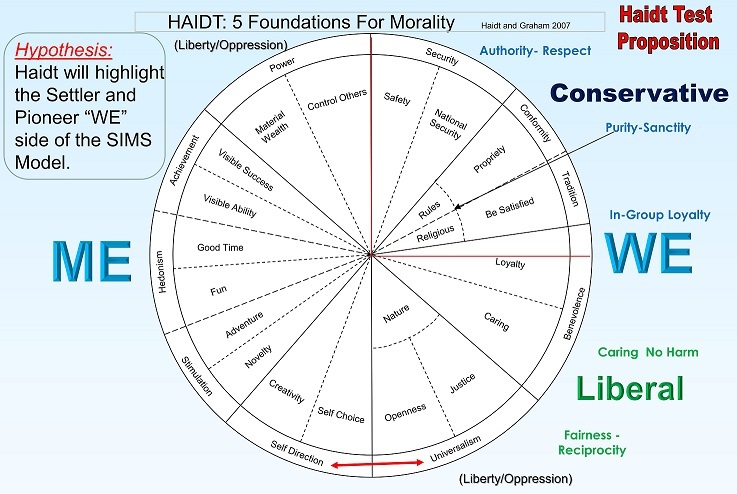 The Haidt Moral model presents us with possibilities for measuring factors that could fill in the WE side of diagram – largely Settler (more likely to be politically conservative) at the top and Pioneer (more likely to be politically liberal) at the bottom. The better question to ask is, ‘is this true’? It is possible the Moral factors will be centred in the spaces on the Settler and Pioneer WE scale – we just don’t know. All the better reason to find out! Haidt has measured the factors on over 100,000 people, is clear on five factors and has a strong candidate for a sixth factor – Liberty/Oppression. Our working hypothesis is shown on the final map in this short series. 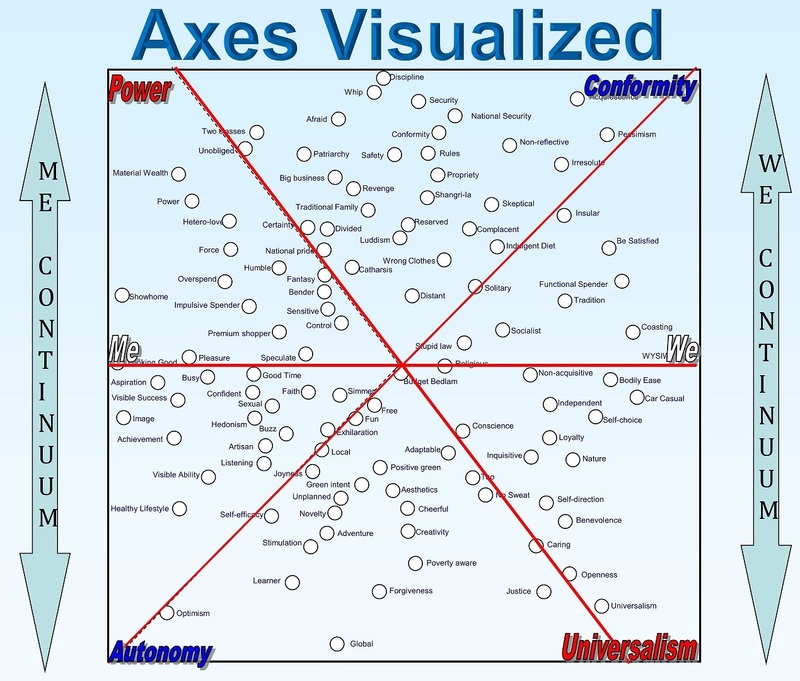 The map includes the likely ‘finalized’ position of the 12 new Attributes. The blue arc represents the space in which we project the new Moral factors will centre. The one anomaly is in black and is the sixth factor. The description of it in the literature doesn’t make it clear if it is a measure along the WE axis or the ME axis. As Haidt wasn’t measuring this axis that is not surprising, and it makes it more interesting for us. Readers of this series will recall we started our journey of discovery of the way CDSM values research relates to other models of human motivations, beliefs, attitudes and personality – and that the first model of motivational research was a statistical examination of OCEAN. That analysis clearly showed that the components of the model were limited to measuring the factors on left hand side of the Values Space and left gaps on the right hand side. The potential of the Haidt model of Morals for filling in this gap has created an intriguing possibility for us. The process of measuring changing values, beliefs, motivations, attitudes, and personality - on an individual level and on a cultural level - is a complex and never ending quest. The search for knowledge, with data and expertise compiled by others in many different fields of inquiry, is one of the most fascinating and time consuming endeavours, in academic research and business science, in today’s world. Without basic research and an understanding of the human psyche, and the dynamic iterative process between different states of individual psyches, the ability of organisations and individuals to change or reinforce existing behaviour is suboptimal. Only by never being satisfied with the last best answer, but always looking for a better question, can leading edge organisations maintain their lead on markets. Organisations that want to disrupt markets will need a deeper understanding of the dynamics of human values changes to create robust and sustainable programs and projects to satisfy changing human values. CDSM will be publishing more insights into our findings over the coming years so that you will be able to keep up with some of the insights our complex and ever-evolving research brings to the world. Thank you for reading this short series and I hope you will get in contact with us to help us identify the NEXT BETTER QUESTION.